Italian carmaker Fiat and US giant Chrysler have agreed to create a global strategic alliance, the companies said in a statement. Under the terms of the deal, Fiat will get a 35% stake in Chrysler. In return, the US firm will get access to Fiat's fuel-efficient vehicle technologies. 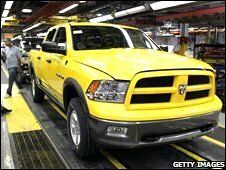 It is hoped the agreement will lead to "substantial" savings for Chrysler. The United Auto Workers union (UAW) welcomed the deal, saying it could help preserve US manufacturing jobs. "[The alliance] offers Chrysler new opportunities to compete in the US market and the global marketplace," UAW president Ron Gettelfinger said in a statement. • "Substantial cost savings opportunities"
• Access to Fiat's distribution network in "key growth markets" outside the US and its global supplier base. • A 35% equity stake in Chrysler. The statement points out, however, that the agreement does not commit Fiat to funding Chrysler in future. Carmakers around the world have seen their sales plummet amid the ongoing global economic slowdown. Chrysler has received an emergency loan from the US government worth $4bn, while Fiat has said it needed a partner because it was too small to continue on its own. Fiat chief executive Sergio Marchionne said the deal represented "a key milestone in the rapidly changing landscape of the automotive sector". Chrysler chairman Bob Nardelli said that the alliance "creates the potential for a powerful, new global competitor". The completion of the deal is subject to approval from regulatory authorities, including the US Treasury. Trading in Fiat shares had earlier been suspended amid speculation of a possible partnership with the US firm. After the announcement was made and trading resumed, Fiat shares rose 3.5%. Also on Tuesday, German carmaker Daimler said it was still interested in selling its 20% stake in Chrysler.